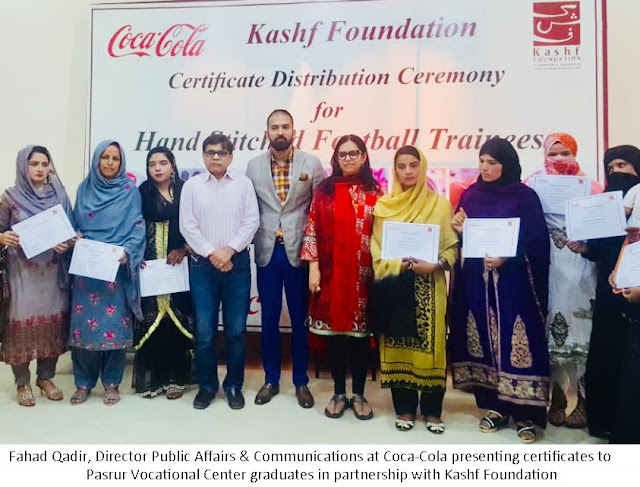 Pasrur: The graduation ceremony of more than 300 female students was held at the Pasrur Vocational Training Center, which is a part of a Coca-Cola funded project ‘Women Economic Empowerment Program’ in partnership with Kashf Foundation. Since 2017, five community based vocational training centers have been set up under this Program, and these centers have delivered 3-months training sessions to the local low-income women of the area, focusing on non-traditional trade for women like football stitching. The ceremony was attended by all the graduating students, and by Roshaneh Zafar, Managing Director of Kashf Foundation and Fahad Qadir, Director Public Affairs & Communications of Coca-Cola Pakistan.